The FDA recently removed GRAS status for partially hydrogenated oils, giving the industry three years to comply. As has long been expected, the FDA on June 16 announced it was revoking the “generally recognized as safe” (GRAS) status of partially hydrogenated oils (PHOs). Food manufacturers will have three years to remove PHOs from products. While they are wonderfully functional ingredients, PHOs are the primary dietary source of artificial trans fat in processed foods, and trans fat has clearly been linked to heart disease. The FDA decision was "based on a thorough review of the scientific evidence" and comes 19 months after the first warning shot in this issue. 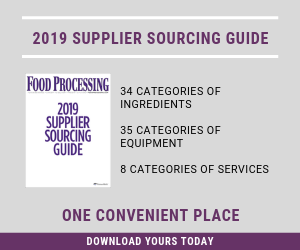 While much of the food industry already has replaced PHOs and trans fats, there remains a significant number of companies that are still wrestling with reformulations. PHOs remain in some cake frostings, microwave popcorn, pies, frozen pizzas, margarines and coffee creamers. Rumors indicate Walmart has told its food suppliers to have PHOs removed from products by this fall. The two most common PHOs currently used by the food industry are partially hydrogenated soybean oil and partially hydrogenated cottonseed oil. Fully hydrogenated oils are outside the scope of this order. The order also does not apply to ingredients that contain naturally occurring trans fat, such as those ingredients derived from ruminant sources. The FDA first announced in November 2013 it was considering removing GRAS status for PHOs. The agency held a months-long comment period, which was extended into mid-2014, during which more than 6,000 comments were received. Private citizens were 100 percent in favor of a ban. So were comments directly from and forwarded by groups such as Center for Science in the Public Interest. Public health groups, such as the National Assn. of County and City Health Officials also supported a ban. So did trade associations and individual vendors who supply alternatives to PHOs. "The U.S. sunflower industry offers immediate solutions to partially hydrogenated (PH) oils," wrote the National Sunflower Assn. About the same came from the U.S. Canola Assn. And from IOI Loders Croklaan, a supplier of palm oils: "There is no reason to continue to use PHOs in food products, as there already exists in all cases alternative fats and oils which provide similar functionality at similar cost in bakery, snack food and confectionery applications." But the American Soybean Assn. said removal of GRAS status would result in significant hardship to soybean farmers. It would "decrease U.S. soybean farmer incomes by approximately $1.6 billion per year." Several food processors expressed mild support for a ban as long as it was phased-in over a long period of time. And FDA apparently has delivered that long phase-in period. The agency set a compliance period of three years. This will allow companies to either reformulate products without PHOs or petition the FDA to permit specific uses of those oils. Following the compliance period, no PHOs can be added to human food unless they are approved by the FDA. Since 2006, manufacturers have been required to include trans fat content information on the Nutrition Facts label of foods. Between 2003 and 2012, the FDA estimates that consumer trans fat consumption (primarily from PHOs) decreased about 78 percent – from 4.6g per day per person in 2003 to 1g per day in 2012. The 2006 labeling rule and industry reformulation of foods were key factors. While trans fat intake has significantly decreased, the current intake remains a public health concern, the agency said. The Institute of Medicine recommends that consumption of trans fat be as low as possible.